One Fat Frog Restaurant Equipment is getting truckloads of used commercial restaurant equipment in every week, keeping the stock fresh and the clients rolling in to see the large selection. Recently One Fat Frog Restaurant Equipment got in several used prep tables, used walk-in coolers, used walk-in freezers, and used three-compartment sinks. And much more! One Fat Frog Restaurant Equipment is letting these three-compartment sinks go for seriously low prices. These used three-compartment sinks are prefect for restaurants, bars, diners, delis, cafes, vegan restaurants, bakeries, etc. If you are in the market for a three-compartment sink, act fast because these used three-compartment sinks won’t last long! One Fat Frog Restaurant Equipment also has double and single, hand wash, and other makes and models of sinks available. Just like with every piece of used commercial restaurant equipment that makes its way through the One Fat Frog Restaurant Equipment Super Mega Warehouse in Orlando, these used three-compartment sink comes with a 30 day parts and labor warranty. Each used three-compartment sink will be cleaned, refurbished, and tested by the One Fat Frog Restaurant Equipment staff of in-house technicians. One Fat Frog Restaurant Equipment offers an easy financing program that can get you approved no matter what shape your credit is in. 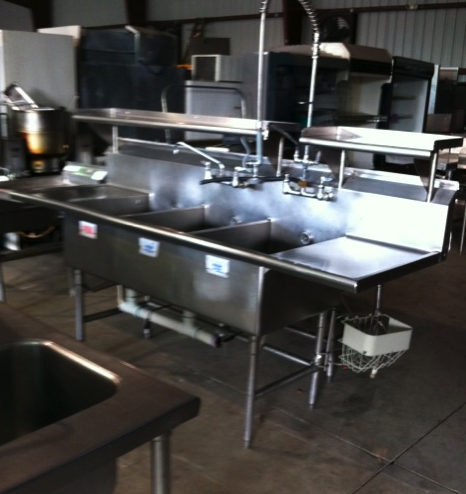 One Fat Frog Restaurant Equipment also welcomes quick cash deals and package deals towards the entire selection of used commercial restaurant equipment at One Fat Frog Restaurant Equipment, including the used three-compartment sinks. One Fat Frog Restaurant Equipment offers more free delivery to more parts of Florida than any other used commercial restaurant equipment dealer in Florida. One Fat Frog Restaurant Equipment delivers absolutely free to Jacksonville, Gainesville, Ocala, Tampa, Sarasota, St. Augustine, Lake City, Lakeland, Ft. Myers, Tarpin Springs, Crystal River, Brandon, etc. One Fat Frog Restaurant Equipment also offers free gas conversion, free custom cutting boards, great deals on used dipping cabinets, free custom paint jobs, and more! Come into One Fat Frog Restaurant Equipment and check out the selection of used sinks!